Welcome to the Week 4 Wide Receiver Rankings! Receiver is not currently a problem position for most of us seasonal players. There are plenty of good options to go around in shallow to mid-sized leagues. The running backs are another story as we’ll see in my next article. My favorite receiving options for DFF this week are looking like Odell Beckham, Jarvis Landry and Antonio Brown, but that could change once I start trying to put lineups together. There are plenty of guys worth considering and things are once again complicated with two of the better games off of the main slate. I’ll get into all of this in more depth on the DFF podcast this Saturday. I will try to have it posted by late morning or early afternoon at the latest. I’ll be back later today with the RBs and TEs. 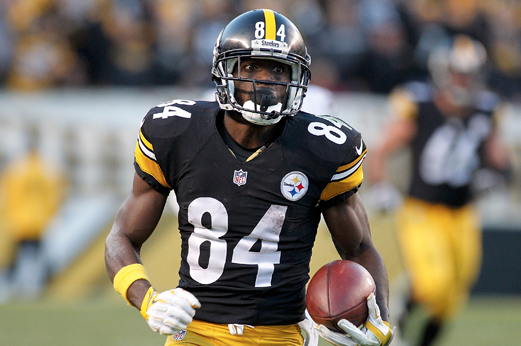 1 Antonio Brown PIT 8.800 BAL@PIT 09/30/2018 08:20PM ET It’s a potential big game spot for AB. CB Jimmy Smith is still out on suspension. He has multiple score potential. 2 Michael Thomas NO 9.100 NO@NYG 09/30/2018 04:25PM ET He’s mashing right now. The Giants may slow him down some but they can’t stop him. 3 Odell Beckham Jr. NYG 8.700 NO@NYG 09/30/2018 04:25PM ET He’ll be shadowed by Marshon Lattimore but I’m not sure that’s good for the Saints. Beckham will get loose against almost anybody. The Giants are gaining momentum and without Engram, a monster day for Beckham in terms of targets is guaranteed. He’ll need the end zone to really pay off in tournaments but he should have a 20+ point day without one. In Draftkings scoring, 7 catches for 100 yards will get you 20 points. 4 DeAndre Hopkins HOU 8.400 HOU@IND 09/30/2018 01:00PM ET Hopkins should be able to grind out a good day and he’ll have a potentially great day if he can drop a score or two. He can beat all of the Colts’ corners, so I like his chances. He never leaves the field (99% offensive snap rate) and is getting a steady 10 targets a week. He could get more here. 5 Julio Jones ATL 8.200 CIN@ATL 09/30/2018 01:00PM ET Jones is a compelling tournament option this weekend and he’s still an easy call as a WR1 in seasonal. 6 Jarvis Landry CLE 7.400 CLE@OAK 09/30/2018 04:05PM ET He’s now playing with the best QB he’s ever played with. I find it hard to see him fail in a full PPR format in this matchup. He’s already got 37 targets on the year and the touchdowns are coming soon. Mayfield is a HUGE upgrade in the red zone—particularly for the receivers themselves because he doesn’t drop his eyes when he scrambles. 7 Mike Evans TB 7.900 TB@CHI 09/30/2018 01:00PM ET Playing really well and should make a big impact in this game. 8 JuJu Smith-Schuster PIT 7.100 BAL@PIT 09/30/2018 08:20PM ET Limited practice with an abdominal injury so I’ll be updating him on Saturday, but I love him if he plays. He’s obviously crushing it so far. 9 Tyreek Hill KC 8.100 KC@DEN 10/01/2018 08:15PM ET Tons of upside but we are seeing how he has a very wide range of outcomes so he’s on my GPP list more than my cash list. In seasonal, you play him every week no matter what. 10 A.J. Green CIN 7.500 CIN@ATL 09/30/2018 01:00PM ET Tough matchup and he’s been nursing a groin injury that forced him from last week’s game. That said, he is expected to play, but check his game day status just to be sure. 11 Keenan Allen LAC 8.300 SF@LAC 09/30/2018 04:25PM ET A good game feels all but assured but they may put the pass game away early in this one, so be prepared for a strong game that ends early. And, with a sore knee, they may shut him down once they get a good lead. Keep tabs on Allen, who has been rested all week. If he sits out Friday practice, his Week 4 status would be in doubt. 12 T.Y. Hilton IND 7.000 HOU@IND 09/30/2018 01:00PM ET Hilton is getting the ball but he’s running more underneath stuff than we’d like to see. He can still make big plays that way, but he’s getting hit more than I’d like to see given his injury history. Hopefully they get more vertical stuff going soon. Hilton is healthy now, so no worries using him as a WR1 or high-end WR2 this week and he’s priced reasonably well for use in GPPs. 13 Will Fuller V HOU 6.800 HOU@IND 09/30/2018 01:00PM ET He’s healthy now and his target share looks very good at this point. It’s really all about getting the ball to Fuller and Hopkins in Houston. 14 Davante Adams GB 7.800 BUF@GB 09/30/2018 01:00PM ET Tough matchup with Bills CB Tre'Davious White, so a big game feels unlikely but Adams has fought through some tough ones already so still viable as a high-end WR2. 15 Emmanuel Sanders DEN 6.900 KC@DEN 10/01/2018 08:15PM ET He’s been great and if not for some inaccuracy from his QB, could have been even better. 16 Sammy Watkins KC 5.300 KC@DEN 10/01/2018 08:15PM ET This should be a high-scoring game and he’s the guy who, I think, the Broncos will use a single defender on. Big upside and a low price tag yet again. 17 Kenny Golladay DET 6.500 DET@DAL 09/30/2018 01:00PM ET Playing very well right now. Solid WR2 play but DraftKings price is higher now. 18 Nelson Agholor PHI 5.700 PHI@TEN 09/30/2018 01:00PM ET He should bounce back in this matchup. 19 Sterling Shepard NYG 4.900 NO@NYG 09/30/2018 04:25PM ET Love him in this matchup. 20 Golden Tate DET 6.600 DET@DAL 09/30/2018 01:00PM ET Should do well but this game will be played at a slowish pace and that hurts volume guys like Tate. ***UPDATE*** Tate popped up on the injury report Friday with a sore hip. He’s questionable so make sure you have a backup plan. 21 John Brown BAL 5.800 BAL@PIT 09/30/2018 08:20PM ET Playing well and his team will need major points this week so look for some deep shots. 22 Kenny Stills MIA 5.800 MIA@NE 09/30/2018 01:00PM ET He’s the one piece you can count on in this passing game. 23 Tyler Lockett SEA 5.100 SEA@ARI 09/30/2018 04:05PM ET Could see a slight bump down if Baldwin plays but still within the WR3 range. 24 Tyler Boyd CIN 4.600 CIN@ATL 09/30/2018 01:00PM ET Loving the way he’s playing. I’m a big Ross fan, but Boyd is playing like the Boyd of old—before the knee injury. This looks more like a new reality versus a passing phase. Cincy has a complete set of weapons now. More good news for Dalton. Boyd gets a bump in full PPR. He’s still a value on DraftKings in cash or GPPs. 25 Calvin Ridley ATL 4.900 CIN@ATL 09/30/2018 01:00PM ET Looked great last week and he’s no fluke. The 3 TDs were obviously an outlier though. As I have been saying, he’s the number two guy here, not Sanu. 26 Demaryius Thomas DEN 5.500 KC@DEN 10/01/2018 08:15PM ET Plus matchup for him this week so hopefully he gets back to being more involved and hopefully Keenum steps up. 27 Allen Robinson II CHI 5.900 TB@CHI 09/30/2018 01:00PM ET He’s been the focal point but his quarterback has been a problem. This week shapes up well for the Trubisky-to-Robinson connection. I think we see a small step forward. That means solid WR3 numbers. 28 Amari Cooper OAK 5.600 CLE@OAK 09/30/2018 04:05PM ET He’s just impossible to predict right now, but still has WR3 appeal. 29 Marvin Jones Jr. DET 5.200 DET@DAL 09/30/2018 01:00PM ET He’s playing the most snaps of the Lions’ receivers so he’s still a viable guy for sure. He’s just not getting as many crossing routes as Golladay and Tate gets most of the underneath looks. Still, Jones will hit his share of big plays. He’s a solid WR3 even with Golladay’s breakout. 30 DeSean Jackson TB 5.700 TB@CHI 09/30/2018 01:00PM ET Dangerous but playing inconsistent snaps so a strong WR3 or flex with big upside. 31 Doug Baldwin SEA 5.500 SEA@ARI 09/30/2018 04:05PM ET I’ll bump him up if it looks like he’s going to play and I’ll move him off the ranks if not. ***UPDATE*** He’s playing and he will start according to reports. He makes a solid WR3 play as he could be on a bit of a snap count. Still worth double-checking his status tomorrow and having a plan B just in case, but all signs are positive. 32 Keelan Cole JAX 5.400 NYJ@JAX 09/30/2018 01:00PM ET He’s the number one now so a solid WR3/Flex play. 33 Chris Hogan NE 5.800 MIA@NE 09/30/2018 01:00PM ET He’s a WR3 with more upside if Gordon sits. There’s some harsh reality coming for Hogan owners if the whole Gordon thing works out. Hogan will be more of a flex play at that point. 34 Josh Gordon NE 6.200 MIA@NE 09/30/2018 01:00PM ET Hard to sit him if he plays but it’s hard to tell right now just what the Patriots are thinking. He’s a WR3 with monster upside. Play at your own risk. 35 Geronimo Allison GB 4.700 BUF@GB 09/30/2018 01:00PM ET Should see more slot love if Cobb sits out. 38 Corey Davis TEN 5.300 PHI@TEN 09/30/2018 01:00PM ET His QB is not healthy so some concerns right now. He is looking very good out there though. Davis has plenty of game. 41 Alshon Jeffery PHI 5.700 PHI@TEN 09/30/2018 01:00PM ET Not a lock to play and could be on a snap count if he does. 44 Courtland Sutton DEN 3.400 KC@DEN 10/01/2018 08:15PM ET He’s playing as much as Demaryius the last two weeks and has just missed a few big plays. Sutton is happening, folks. 47 Marquise Goodwin SF 4.800 SF@LAC 09/30/2018 04:25PM ET Hard to know what kind of offense we’ll get with Beathard at QB. He’s hard a year to work on things so he may be more settled this time around, but this is a rough matchup. 59 Randall Cobb GB 5.100 BUF@GB 09/30/2018 01:00PM ET He may have pulled a hammy in practice on Thurday. I’ll update him this weekend. ***UPDATE*** He’s questionable but he skipped the saturday walkthrough so that’s not good. I’d be making other plans here as Cobb is now risky either way. 78 Keke Coutee HOU 3.000 HOU@IND 09/30/2018 01:00PM ET He’s a player to watch. He’ll make his debut this week and with Bruce Ellington done, there’s playing time to be had. 99 Rishard Matthews FA 3.600 PHI@TEN 09/30/2018 01:00PM ET He’s free to sign with another team, but unlikely to be playing anywhere this week. Buffalo or Dallas would be a nice spots, but he may have better options. 101 Stefon Diggs MIN 6.100 MIN@LAR 09/27/2018 08:20PM ET (ALREADY PLAYED) He can win outside in this matchup so they will need him in a big way. If they can block up a few looks for him, I expect a big play or two. 102 Adam Thielen MIN 6.500 MIN@LAR 09/27/2018 08:20PM ET (ALREADY PLAYED) Tough matchup, but his role is locked in and they have injuries to their DBs. He’s worth even more in full PPR so bump him up. 103 Brandin Cooks LAR 6.400 MIN@LAR 09/27/2018 08:20PM ET (ALREADY PLAYED) He’s going to get shadowed by Xavier Rhodes unless Zimmer pulls a fast one, but I doubt it. That makes Cooks a bit riskier than normal but not a player I’d consider benching in most circumstances. He’s still a big play threat. He’ll get some looks way from Rhodes. 104 Robert Woods LAR 5.400 MIN@LAR 09/27/2018 08:20PM ET (ALREADY PLAYED) I think he’ll see plenty of targets tonight. 105 Cooper Kupp LAR 5.100 MIN@LAR 09/27/2018 08:20PM ET (ALREADY PLAYED) He should see the ball in the slot tonight.